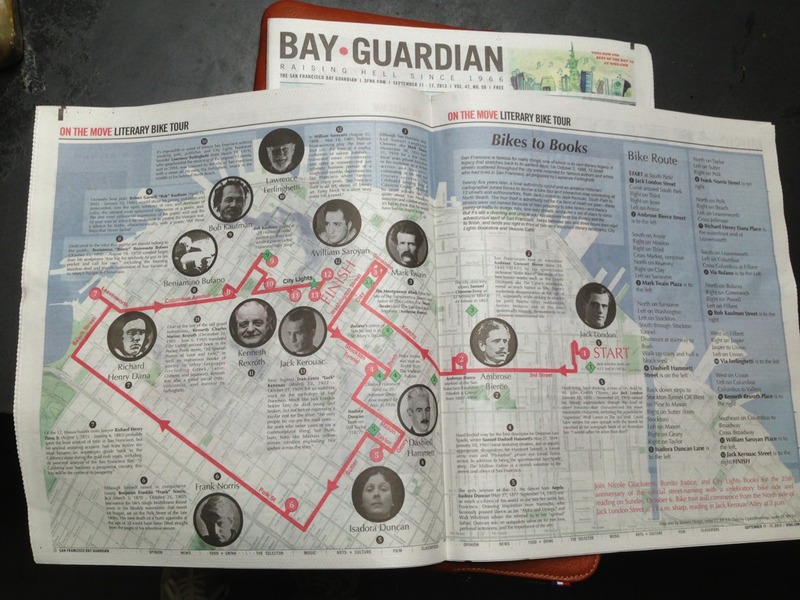 In conjunction with the esteemed Nicole Gluckstern, I present to you a bike tour of San Francisco literary figures, printed in today’s Bay Guardian! In 1988, thanks to the effort of City Lights founder Lawrence Ferlinghetti, 12 streets were named after authors and artists who made San Francisco home over a century and a half. 25 years later, Nicole contacted me and asked if I would help her make a map, to which I naturally said yes, because hey, maps! So run as quickly as you can to a news rack (remember those?) and grab a copy. Nicole Gluckstern, Burrito Justice and City Lights Books announce the publication release party for their collaborative bike map/tour: “Bikes to Books,” Sunday October 6 at City Lights Bookstore in San Francisco, celebrating with both a bike tour and reading in Jack Kerouac Alley. Combining San Francisco history, art, literature, cycling, and urban exploration, “Bikes to Books” began as an homage to the 1988 street-naming project spearheaded by City Lights founder and former San Francisco Poet Laureate, Lawrence Ferlinghetti, in which twelve San Francisco streets were renamed for famous artists and authors who had once made San Francisco their home. Twenty-five years after the street-naming proposal was passed by the then the Board of Supervisors, local author and city cyclist Nicole Gluckstern devised a bike route connecting all twelve streets into a comprehensive bike tour, and enlisted avid amateur historian Burrito Justice for the creation of an interactive, multi-functional map. Published in collaboration with City Lights, the map is appropriate for use as a navigational tool, a history lesson, and a unique work of art in its own right. Satori in San Francisco! You had me at bikes… and books… and maps… and party… IN! Who wouldn’t want to be a part of this?????? ?